The costume I am currently working on calls for a stretchy, shiny, wet-look fabric. I choose to work with PVC for my Laura Kinney costume because I think good quality PVC looks gorgeous! Though there are some very helpful tips and tricks already on the internet to help beginners sew with this challenging fabric, I would like to add to the existing pool of resources with my on experiences. PVC is a plastic fabric. It is shiny and smooth on one side, and on the other, it has a woven fabric backing, normally of polyester. It comes in not-stretchy, 2-way stretch, and 4-way stretch. The not stretchy kind is known as Patent Vinyl. PVC most often refers to 2-way stretch, which means it stretches more on the horizontal than it does on the vertical, and 4-way stretch is called stretch PVC, which stretches equally in both the horizontal and vertical directions. Patent Vinyl can be is a heavy-duty fabric which can be used to make purses, belts, faux-armor and as upholstery. 2-way stretch PVC is good for raincoats and clothing that need a little stretch, but less stretch than a spandex or lycra would provide. 4-way stretch PVC is very stretchy and is typically lightweight, making it appropriate for swimsuits and lingerie. For my costume, I worked with a light to medium weight 2-way stretch PVC. Here is what I’ve learned…..
PVC is both slippery, and sticky. PVC will slide against itself, and unfold very easily, but it also sticks to sewing machines. This sticking to the walking feet under the fabric, and the presser foot above it causes the top and bottom layers of fabric to go through the machine at different speeds, resulting in ugly bumps, unintentional gathers, and the fabric getting sucked down into the machine. I’ve seen it recommend online that you use a teflon presser foot, tear away tissue, and a special PVC lubricant to help solve this problem. Now, I don’t know about you, but I wasn’t about to order an expensive fabric lubricant, and wait for it to get here just to make one costume. Maybe if I worked with PVC all the time I would try it out, but I find that there are other ways to get around this problem. Now, the fabric will occasionally stick to the presser foot because I do not put tissue on top of the seam. You may put tissue on top if you really need it, but I find that this blocks my view and my seams come out crooked. Instead, I keep a taught grip on the top layer, and sew slowly, always checking for ripples and puckers to smooth with my fingers as I go. PVC does not heal. Because PVC is made of plastic, and not woven like a normal fabric, the holes that you put in it do not heal. That means every hole that you make, whether it be by a pin or needle, stays there. If you make enough holes in one spot, the holes will become very visible, and if you make even more holes, you actually compromise the strength of the seam!!! This means you don’t get a lot of second chances with PVC. If it all possible, it’s best to get it right on the first try. This is why its important to have a scrap piece for practice. Use a test piece to check that the machine is threaded correctly, that the fabric won’t stick, and that the tension is how you want it. (Mine is between 3 and 4 for PVC but every machine is different. See your machine’s manual). It is also important to use a sharp needle, preferably thin needle. The sharper the needle, the smaller the hole that it will make. However these sharper needles are far more brittle than the heavy-upolstery needles that I normally sew with, so you need to be careful not to hit any pins or the needle will break. Because PVC is not self healing, you should not baste, or stay-stich, even when the pattern calls for it. Use low-tack tape like scotch or masking tape, or a few pins for basting, and skip stay-stiching all together. Tear-away is hard to tear away, but it works. The point of tear-away tissue is to stabilize the fabric while you sew, and then to tear it off the seam when you’re done, leaving a perfect seam behind. The problem is, when you tear away the tear-away, a lot gets left behind. This can make your seam look terrible because it’s filled with tiny fuzzy paper fibers, which are a different color from your fabric. (You should use a paper that contrasts your fabric so that you can see it) But don’t panic, you CAN get this tissue paper out with patience. First of all, when you tear away the tissue, tear towards the seam, this will get more paper out on the first try. Now get out your tweezers. Yup, tweezers. You will now sit in front of the Tv, and extract each and every remaining fiber. It works, it’s time consuming, but it will look good in the end. Soap marking is great. Because PVC doesn’t heal, tailor’s tacks are out of the question. So I use soap to mark my fabric instead. It can be found in your bathroom, sharpened to a point, and rubbed off with a damp cloth when you’re finished. Or if you don’t rub it off, it will fade to nothing anyway in a few days time if the fabric is in use. PVC smells when it’s new. When I first opened the envelope with my PVC fabric in it, it REEKED like a plastic factory. This is because when plastic is made, it smells bad, and this bad smell clung to the fabric. Not to worry, its very easy to get rid of. If you want, you can gently hand-wash your PVC by letting it soak in some cold water and just a little gentle detergent. It will be okay, just don’t use water over 170 degrees. But the even easier way to get rid of the smell is to just air it out. I hung my fabric on a chair outside, and in about 4 hours the smell was gone. PVC is tough on thread. I don’t exactly know the reason why, but PVC breaks thread like crazy. I think the thread might be sticking to the fabric. So if you’re going to work with PVC, get a good thread, go slow, and check often to make sure you haven’t lost your thread. There’s nothing worse than finishing a seam and realizing you lost your top thread about 3 quarters back. Use a stretch stitch, but don’t stretch while you stitch. Lots of PVC is stretchy, and so people get the urge to stretch the fabric while they sew. Don’t do this! It will not recoil to it’s original shape because the seam you put in it will hold it in its stretchy position. Instead, just let the fabric be, and pin it at it falls. Pin it flat, but don’t pull at it. Use a stretch stitch, but don’t stretch the fabric while guiding it through the machine. The stretch stitch will allow the fabric to stretch once you take off the tear-away tissue, and it will recoil and hold its shape nicely. Do NOT apply heat. Do not, under any circumstances, press your seams. Heat will melt your PVC, turning your garment into hot slag. That’s a technical term for burnt plastic mess. For this reason, darting PVC is not recommended. The seams will not lye flat and there is nothing you can do to get them to lye flat besides top-stitching, which will look funny next to a dart. Top stitching is a good way to get other seams to lye flat, like hems. Top stitching looks great on hems! PVC does not fray so there is no need to finish your seams other than for looks sake. You can use a surger or a stretch zig-zag stitch to finish your seams, but remember you can’t press them, and finishing seams often makes them bulky and stand upright. Consider this and proceed with caution. Well, that’s all I’ve got for today. I hope that helps. If you have any questions, please, don’t hesitate to ask. Happy sewing!! This is a very thorough tutorial, thank you for taking the time to write it. I have a few questions. Using tissue paper did you ever have it get caught up on the bottom grips/teeth of the sewing machine? Also did the pins leave noticeable holes? Mostly a curiosity as I haven’t worked with PVC myself yet, but I’ve read elsewhere and you said it yourself that PVC doesn’t heal like clothes would from holes. The tissue paper almost never snagged in the feed dog teeth. If it did get a little caught, it tore right out and no pieces were left in the teeth, nor was the fabric damaged at all. If the fabric got sucked into the machine instead of the tissue, it would absolutely suffer damage. The tissue may get a little torn up in the feed dogs from time to time, but the fabric won’t suffer and you should be able to keep sewing without stopping. You do have to be careful about pin choice when working with PVC. I recommend small, sharp dress-makers pins with glass heads–the kind you would use to sew silk because these leave the smallest hole. 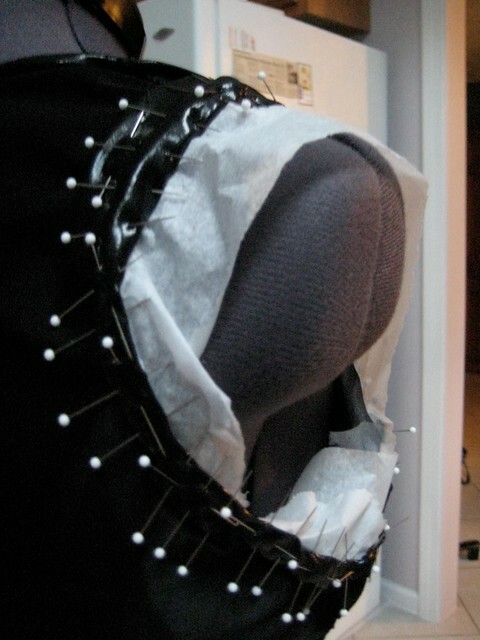 Big pins, or old pins which have dulled will make bigger holes in the fabric. Pin holes can range from nearly invisible to an eye-sore depending on your pin, but all pins make holes in PVC, and there is nothing you can do to repair them. Same thing goes for the sewing needle: all needles make holes! So don’t mess up a stitch, or you will be left with needle “tracks” when you take out the stitch, and these are really ugly! That’s reassuring to hear about the tissue paper. Haha I hate how cloth looks after having to pull stitches out from a slipped seam, even after its healed a bit. I can only imagine how bad PVC would look. Also I had no clue pins came in different sizes, that’s great to find out, and now another thing added to my list of items to get. Where can i get clear vinyl in uv color??? The internet? A garment district? I get most of my weird fabrics from ebay or through google searches. I used to just powder my sewing machine, with baby powder and it helps the sticky part slide, easy wipe down, cheap and effective. I have never heard that trick before. I would be concerned with the powder entering the machine and absorbing the lubricants which help the machine function smoothly, especially in the bobbin area. Did you ever have any problems like this? I have used baby powder before I got my walking foot, but the water soluble stabilizer sounds more effective. I have a double needle/double bobbin cylinder arm industrial Consew and thought it would glide beautifully on anything. Wrong! I don’t know why I didn’t think of the stabilizer. A duh moment I guess. My wife has asked me to create a swimsuit for her out of the glossiest material I can find. She actually wants to swim in this thing, which means it’ll end up exposed to chlorine and/or ocean salt water. How do you think 4-way stretch PVC would hold up? It will work for a little while, but she shouldn’t expect to own this shiny bathing suit for a long time. I’ve seen PVC used in cheap juniors bathing suits in clothing stores like “Wet Seal.” They are water proof-ish, but require such gentle care while washing (cold, hand-wash, with light detergent, do not over-stretch), that I’m a little worried about how the fabric will last after say 5 exposures to chlorine, warm hot-tub water, or the ocean. My recommendation is to think of a PVC bathing suit as more sun-lounge-wear, and less swim-wear. Thanks for the great post! I live in Papua New Guinea and fabric is limited. My wife and I were sewing up some car seat covers with vinyl and it was giving us a hard time. After pinning it perpendicular and adding tissue paper to the seams it worked like a charm! I’m just about to start sewing some PVC bags and searching for tips. This post is great. I read on several blogs about the thread tending to break a lot. One post gave a solution to this, and explained that the Leather sewing machine needles have a groove down the front for the thread to sit in, which reduces the friction as the needle goes through the fabric. This helps prevent thread breakage. Hope this helps someone.